If you are a poetry lover, you must be familiar with the positive power that a poem can provide us. I have quoted many inspiring lines from the famous poets in one of my earlier posts. ‘If’ by Rudyard Kipling being my favorite. Poetry soothes the writer as well as the reader. Recently I stumbled across this gem, an outstanding poem written in 1932. It demonstrates an incredible power to assuage loss and anguish. Though the poet had written it for her friend who could not visit her mother’s grave due to disturbing times, its popular appeal can be judged from the fact that it was read by the father of a young soldier, who had been killed by a bomb in Northen Ireland. The poem conjures a thousand images of nature to lift the gloomy mood, which fades away in the wake of so much positivity. Read it twice and you would be transported into a different world. Those who consider reading or writing a poem a difficult task have probably not been introduced to poetry at an impressionable stage of life when emotions and sensitivities are forming. It is just like book love; some of us are passionate readers while many people don’t care for a book. I know many persons who have not read a single book in their life. When you try to understand the reasons behind this habit, most of the times you would discover that they had no exposure to reading in their childhood. From Rumi to Rudyard Kipling to Maya Angelou, poetry has always evoked images of romanticism, realism and Sufism and we get carried away with those images depending on the phase of our life. A renowned Urdu poet, Mirza Ghalib says, “Love is a river of fire and you have to drown in it to reach it.” Love could perish you, that’s what Ghalib’s quote is trying to convey through just one couplet and he is talking about romantic love. “The poetry of the earth is never dead,” John Keats has compressed all pervading beauty of nature and its subtle sounds just within one line. Have you felt the positive power of poetry? World Book Day – a day that celebrates reading, a day that always inspires me to renew my love for books and share it, a day that reminds me how meaningless life would be without books! Reading has not only given me pleasure, added brilliance to my gloomy hours but has also enriched my life in various ways. It has made me wiser, healthier, resilient and emotionally balanced. It helps me converse with the greatest thinkers and dreamers. Reading inspiring stories reassures me that inspiration could be found anywhere, even in the tears of detachment. Fictional characters too have the potential to enthuse new energy into us. Reading gives us the capacity to understand, to absorb and to figure out that anguish, loss, grief is a universal phenomenon. Getting stuck in our suffering can block our own growth. When you equate your painful experiences with others, they seem trivial and you learn to deal with them. The connection becomes the healing factor. Reading drags you out of your cocoon to watch the world with a fresh perspective, which develops when you are exposed to various views. Pain, misfortune and emotional hurts are inevitable. It is futile to immerse ourselves in the setbacks of life because sooner or later we have to abandon this baggage to move ahead. Reading helps us escape the mundane events of life, it takes us to places, which we could have never visited; it defines our purpose of living; absorb the ideas that appeal to us and then analyze them. The best moments of our life are created by reading; the best flights of imagination are crafted by the words of a writer who can create a scenario, which transports us into the realms of our choice and stay there frozen in time. Stories of guilt, horror and forgiveness acquaint us with those realities of life, which could remain hidden from us. The atrocities of the past, the oppression and discrimination recorded in the annals of history unfold before us when we read. Even those who choose light, romantic stories get a whiff of the truths of love and life and learn that freedom to live our life the way we want to, was not always possible and is still a far cry for many. The magical power of friendship and reverence, social interaction and kindness is revealed through reading fiction. We can learn some profound lessons of life from fictional characters. Reading enhances our emotional quotient, our capability of understanding people, complex human behavior and their frailties. I didn’t know how forgiveness could free us from self-imprisonment till I read about it. Have you noticed how a virtuous character leaves a lasting impression on your mind? Nobody likes a villain who is always conniving to make life difficult but we learn to distinguish between the good and the bad from his devious ways. 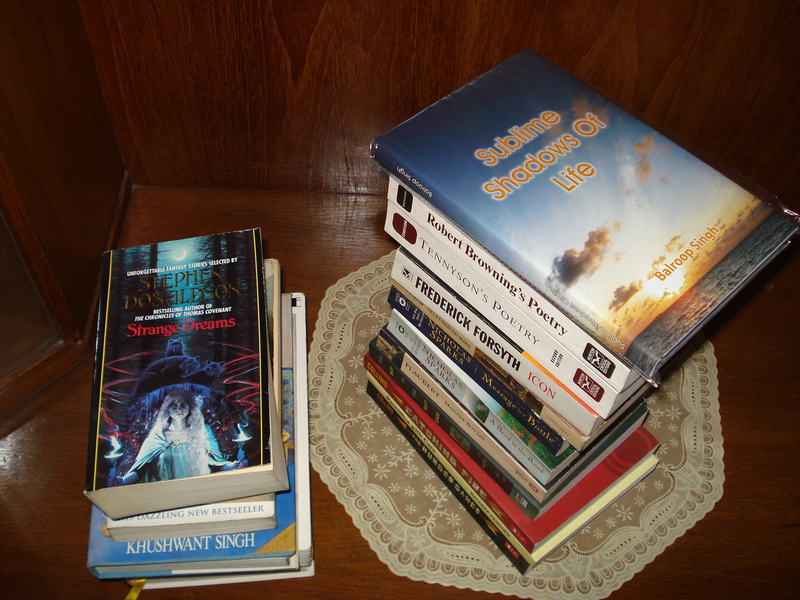 Reading poetry honed my aesthetic and analytical skills and has made me more sensitive towards the beauties around me. It also introduced me to the finer emotions of humanity. Has reading affected your personality? I would love to hear your perspective. Why don’t I set a target? I know you are surprised and curious! I know you are thinking that targets or goals form an imperative part of our lives and without them we may seem like a rudderless boat, which would never reach anywhere. There are some targets, which seem inevitable, which are like milestones and refuse to move till we accept them as realities. I know! I too had to honor them but I would call them compulsive cahoots, gnawing at our minds everyday, challenging our abilities and pushing us closer to the curve of compliance. Setting goals for reading? Really? What confounds me is setting targets for joy, happiness, travel, leisure and above all reading! I have heard many times…‘this year I am going to focus on happiness’…as if our focus on this fleeting emotion ever wavers! Setting targets for pleasure trivializes the term ‘goal,’ which inspires vision and success in the chosen field. Unconditional commitments do make us determined but isn’t it better to reserve them for more important achievements? I have always encouraged my students to set academic goals to reach the pinnacle of glorious pedestal they would like to perch on and many of them have accomplished them. I have never set a target of reading books, as I believe we read for pleasure, not for meeting goals and invite unnecessary stress. There are many other triggers around us to cause stress. I have never kept a count of books I have read for all these years. Completing a book and starting another one is as normal for me as changing an outfit. While Goodreads keeps nudging me to set a target, I remind myself …’If you take a book like a medicine, it loses its charm.’ I had learnt this lesson long ago when I could not read the specified number of books for my Literature discussions! The more I tried to keep up the pace; my concentration grew less and less. Pledging to read a book within a specified time is like a noose hanging before me, depriving me of all the joy connected with the style of the author and language of a book. Is it all about numbers? Reading is not just about numbers and being able to say… ‘I have read 25 books this year.’ It is more about absorbing the thoughts, savoring the words, imagining and connecting with the places. It is a breezy journey to enjoy, not a whirlwind to escape! Quality of reading enriches our experiences, not the quantity. It is more rewarding to read a book slowly so that we can absorb the virtuousness of our favorite character…to drench in the feelings of people around us…so that we can become a part of their world. Some people don’t get emotionally engaged in a book, they read it very fast, without actually stepping into the realm of fantasy, without identifying with the characters and their thoughts. One of my friends had this habit of reading the books very fast. Whenever we would mention a book or share it, she would come out with this reply… ‘Oh! I have read that!’ At that juncture of life, as a young and immature reader, I would envy her speed. I even tried to read in her manner but honestly speaking, I could hardly enjoy the book and felt guilty too. Shallow reading seems to be the norm of the day just to complete the resolution of reading a specified number of pages during the day. If the book is a cheap romance or a thrilling mystery, delving deep into it may be inconceivable but we get out of such books quite early in life. Reading without any distractions around us – another challenge of modern times! The other day I happened to be at a hospital, waiting for a procedure of a dear one to be over and to keep my thoughts positive, I had taken my kindle along with me. I tried very hard to concentrate with chit chat going all around, two ladies talking continuously, exchanging their views on every possible topic from hair styling to cooking! I had read 20% of the book but I want to start it again for the pure pleasure of soaking in the beautiful words, which got lost in the crescendo around me. Do you set targets for reading? Do you read faster to reach those targets? I am waiting eagerly for your perspective on commercialization of reading for pleasure.